It’s a well-known phenomenon that Google keeps on updating their world known search engine to make it more useful and informative for their users and this time, they have come with a big-bang update for the brand’s official business page on Google. YES!! You can now see the popularity of a place where people visit spent time with friends and family. As per my research, this update is limited up to those places which are publicly open and are not related to any kind of business services offered by any company or organization. The major advantage of that update is, people can easily see the most favourable time for them to visit that particular place (Only if, there is an official brand page of that particular place). There is a new section added which shows a graphical representation of the data “Based on historical visits to this place“. The historic data highlights the “Most Popular Times” to visit that place or we can say, the time when most people generally used to visit. The data is measured on weekly basis i.e. “Mondays to Sundays” depending upon the number of people visiting within a time frame of 3 hours. 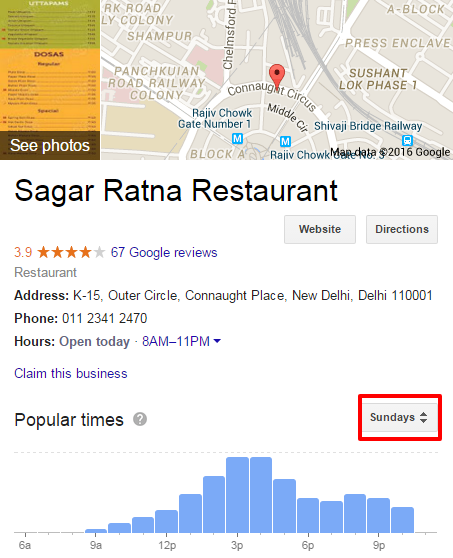 Below are some images, I have collected from Sagar Ratna Restaurant’s Google business page, which shows the Popular Times and Days on which people mostly used to visit. Here, you can see the section for Popular times along with the DAY (Monday). 6a stands for 06:00 AM and the same goes with 9a. 12p stands for 12:00 PM and the same goes with other times after 12a. You can see the visiting stats for other days just by changing the day from the day’s section, highlighted in Red (Right Hand). See Example Image Below shared for Sunday. Now, the question is that!! Is this update happening only in India or anyone of has seen that similar stuff for your country also? If yes, then from how long? 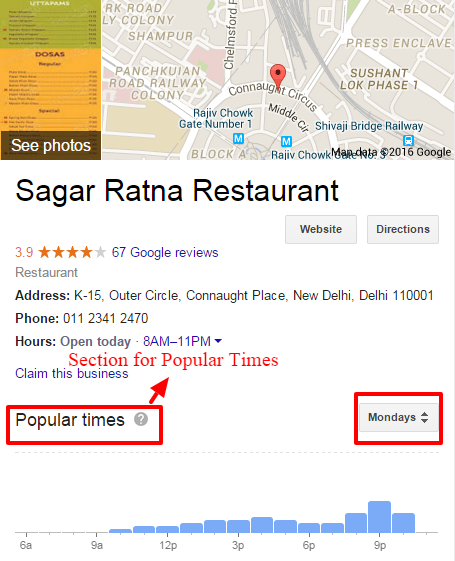 Or, is there any post update from Google for this change on the brand business page? Share your thoughts through the comment section below!